After my blog post a couple of weeks ago about Twinings changing their Earl Grey formulation, I went to my favorite online forum (the Straight Dope Message Boards) and started a poll to see what people thought about it. I never thought at the time that it would lead to a whole new spin on Earl Grey tea. What picture could I possibly use to illustrate this blog post? 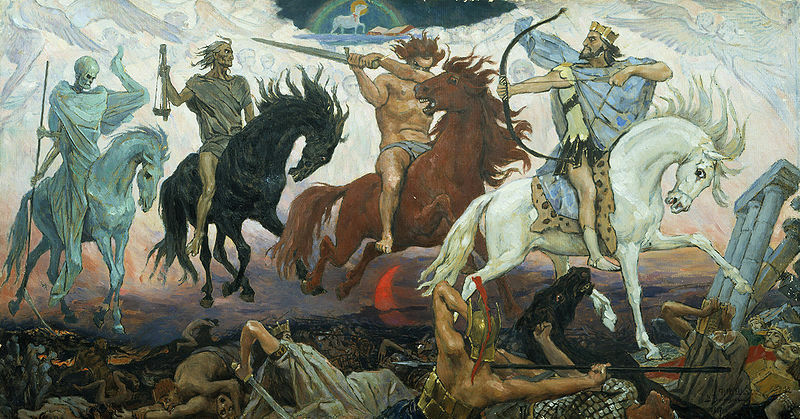 Ah, The Four Hoursement of the Apocalypse by Vasnetsov, of course! My goal was to create a blend that would make you feel like you were sitting among the smoldering remains of civilization, enjoying a nice cup of tea before hefting your shotgun and going back to fighting off the zombies. After another week or so of experimentation, I think I hit it. “Mr. Excellent’s Post-Apocalyptic Earl Grey” has officially gone on the menu at our tea bar, and as soon as I have the new tea website finished you will be able to buy it online. Thank you, Mr. Excellent, for the idea and the name. I hope you enjoy the tea! Posted on 16 September 2011, in Styles & Blends, Tea Biz and tagged earl grey, lapsang souchong, Mr. Excellent, Mr. Excellent's Post-Apocalyptic Earl Grey, SDMB, Straight Dope, tea. Bookmark the permalink. Leave a comment.